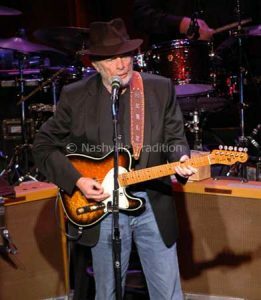 Merle Haggard performing at the Ryman Auditorium in Nashville, TN. Merle Haggard was a free-thinking individualist long before the “Outlaw Movement” shook up the country music establishment. He never let stop signs of any kind get in the way of what he wanted to do. Moreover, unlike virtually all of the singers labeled as “outlaws” in the 1970s, “Hag” was a genuine outlaw. He spent more than two-and-a-half years in San Quentin State Prison for attempted burglary in the late 1950s. Above and beyond his real-world hardships and artistic authenticity, Haggard will forever stand as one of the greatest vocalists, one of the most influential stylists, and one of the most perceptive writers in the history of country music. Merle Ronald Haggard was born on April 6, 1937, in Oildale, California—just outside Bakersfield. His father, James, worked as a carpenter for the Santa Fe Railroad, and the family called a converted boxcar its home. James, who also played guitar and fiddle, died from a stroke when Merle was only nine years old. While his mother worked as a bookkeeper, Merle was raised partly by his great aunt and uncle. During the next few years, the rebellious boy often got into trouble by running away, skipping school, and committing petty crimes. Consequently, he spent much of his youth in reform schools. Merle inherited his dad’s love of music. He especially liked the Western swing of Bob Wills and the honky-tonk sounds of Lefty Frizzell. He began playing music at local events when a teenager. He also began committing more serious crimes, like stealing cars and writing bad checks. At age 15, he and a friend were arrested for robbery, leading to a short spell in jail. But he kept getting into trouble after his release and was in and out of reform facilities and jails. By the age of 20, he was serving time in San Quentin for attempted burglary of a restaurant and escape from county jail. While in San Quentin on New Year’s Day 1959, Haggard attended a prison concert by Johnny Cash. Seeing the Man in Black helped inspire Merle to pull his life together. After getting released from San Quentin on parole in 1960, Haggard headed back to Bakersfield to enter the area’s newly vibrant country music scene. Bakersfield was becoming known for a rougher, edgier style of country—personified by Buck Owens—than that being produced in Nashville. Haggard also worked in Las Vegas with Wynn Stewart during this time. In 1963, he recorded the Stewart composition “Sing a Sad Song” on a small label, and the tune climbed into the top 20. In 1965, he scored his first top-10 hit with “(My Friends Are Gonna Be) Strangers”—a song that inspired the name of his band, the Strangers. His self-penned “Swinging Doors” and “Tonight the Bottle Let Me Down” (later covered by Waylon Jennings) both charted in 1966 and remain among the all-time-great honky-tonk songs. Haggard and the Strangers performing “Swinging Doors” in 1967. Haggard had become a household name among country fans by 1967, when he had three number-one hits: “The Fugitive,” “Sing Me Back Home,” and “Branded Man.” He wrote the latter two songs based on his prison and post-prison experiences. Hag was personally encouraged to write and record such songs by Johnny Cash, who was a strong advocate for prison reform and the rights of ex-convicts. In 1968, Haggard continued his musical semi-autobiography with “Mama Tried,” which described the wayward behavior of a young man who ended up in prison despite the best efforts of his mother to raise him well. Hag singing “Branded Man” in 1968 with his second wife, Bonnie Owens (who had previously been married to Buck), singing backup vocals. As his career peaked in the late ‘60s and early ‘70s, the wild-living Haggard ironically became known as a voice of conservatism and of the political Right. This was during the most intense period of the anti-Vietnam War protests and the hippie counterculture. When the traditional middle-class public heard Hag performing the blue-collar anthem “Working Man Blues” (1969), the anti-marijuana and anti-hippie “Okie From Muskogee” (1969), and the diatribe against war protestors “The Fightin’ Side of Me” (1970), they identified with the conservative sentiments that Haggard wrote and sang. Haggard was a patriotic man grateful for his second chance at enjoying the freedom and success that America offered him. The counterculture movement of the ‘60s angered him. However, Haggard, who would be married five times during his life, was far from a typical right winger, and his political and social views evolved over time. Despite his “we don’t smoke marijuana in Muskogee” lyrics, Hag was a regular smoker of pot by the time he was 40. And in 2005, he played concerts with Bob Dylan—one of the most revered voices of the ‘60s political Left. Some of Haggard’s hits from the ‘70s include “It’s Not Love (But It’s Not Bad)” (1972); “If We Make It Through December” (a 1973 ballad that became his biggest pop hit, reaching 28 on the pop charts); “A Working Man Can’t Get Nowhere Today” (1977); “Ramblin’ Fever” (1977); and “It’s Been a Great Afternoon” (1978). Haggard recorded many Bob Wills songs during his career, including an entire album in 1970 as well as later singles, such as “Cherokee Maiden” in 1975. He even sang and played fiddle on Wills’ last album, recorded in late 1973. Merle Haggard leads Bob Wills’ Texas Playboys in a tribute to Wills. His charted singles slowed in the ‘80s, though popular songs in that decade included “I Think I’ll Just Sit Here and Drink” (1980), “Rainbow Stew” (1981), “Pancho & Lefty” (from a 1982 album of that name with his friend Willie Nelson), and “Twinkle, Twinkle Lucky Star” (his last number one, in 1987). Throughout his career, Haggard had 38 songs reach the number-one spot on the country charts. A 1982 duet album with George Jones, A Taste of Yesterday’s Wine, included the Nelson composition alluded to in the title. And a second duet album with Willie, Seashores of Old Mexico, was released in ‘87. In 1994, the Country Music Hall of Fame inducted Haggard as a member. He had been named to the Nashville Songwriters Hall of Fame in 1977. In 2015, another duet album with Willie, Django and Jimmie, was released. In a video of one of that album’s songs, “It’s All Going to Pot,” the former Okie From Muskogee is seen enjoying some weed with Willie. Merle and Willie record Dylan’s “Don’t Think Twice, It’s Alright” for their 2015 album Django and Jimmie. Merle was scheduled to perform concerts with Willie in 2016. Sadly, however, Haggard died on April 6 of that year—his 79th birthday—after a months-long battle with pneumonia. He passed away while resting in his tour bus parked outside his home in Palo Cedro, California. Merle Haggard with Peggy Russell. Sing Me Back Home: My Life. Times Books, 1981. Merle Haggard with Tom Carter. Merle Haggard’s My House of Memories: For the Record. HarperCollins Publishers, 1999. Mikal Gilmore. Merle Haggard: The Outlaw. Rolling Stone. May 5, 2016. Chris Heath. Merle Haggard: The Last Outlaw. GQ. August 7, 2012.